The pharaohs are at war in this mummy defense game and you will need to help your ruler. 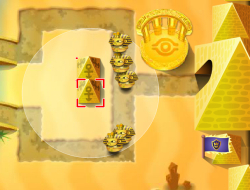 There is a path leading to the enemy pyramid and you need to make sure you infiltrate the other one as fast as you can with as many units as possible in order to take control of it. To do this you will need to, on one hand create units that will march towards the enemy base and on the other hand, build some defensive turrets that will prevent the enemy units from barging in to your pyramid uninvited. You can do research and learn how to construct new items and buildings that will bring you a great advantage in this war. Mummy Defence 0.00 between 0 and 10 based on 0 votes.